Distance: 2.4 miles (3.8 km) round trip from the trailhead to Mirror Lake; 4 miles (6.4 km) to go all the way to the end of the trail in Tenaya Canyon and loop around. If you're hiking from Curry Village instead of riding the bus to the trailhead, add an extra 1.5 miles (2.4 km) round trip. Why visit Mirror Lake? Not to see a lake, that's for sure. Mirror Lake is in fact just a big pool in Tenaya Creek. It is a pleasant walk, and about as close as you can get to the base of Half Dome, whose crown you can see reflected in the lake's waters from some locations. 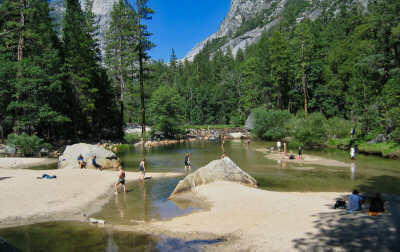 Mirror Lake is also one of Yosemite's most popular swimming holes. Scenery Summary: It's a pretty hike, but probably not worthy of the heavy crowds it draws in the summer. Like the least house in an exclusive neighborhood, this hike gets overvalued (and over visited) because it's in Yosemite Valley. The pool at Mirror Lake and the view of Mt. Watkins (8,500 feet/2,600 meters), which rises above the far north end of Tenaya Canyon, are the scenic highlights. Although you get very close to the base of Half Dome here, it's probably not the best angle to see it from - after all, who does look good when you're gazing straight up their nostrils? Crowd Factor: Mirror Lake is the biggest swimming hole in Yosemite, so you'll find all shapes, sizes, and textures of people here. Difficulty: Easy. There's not a lot of climbing, and much of the trail is paved - you can even ride your bike most of the way to Mirror Lake. Best Time to Visit: If you're a swimmer, whenever it's hot out. Otherwise, go in the winter winter, when the trail is still open but it's not nearly so crowded. Nearest Restrooms: Along the trail near Mirror Lake. Nearest Snacks: At Curry Village. Getting There: The trailhead, well marked, is at the far east end of Yosemite Valley. You can take the shuttle bus directly to the trailhead or hike east from Curry Village or the Ahwahnee Hotel.